You set up shop. You had fun puttin’ on the blitz. You landed some freelance writing gigs. You even managed to get a respectable rate. Now…how do you put that money in your pocket? The bad news: The stories are true. I have experienced each of these scenarios, as well as other frustrating situations, when I’ve attempted to get paid for writing work. The good news: These stories are not the norm. They happen, but not all the time. More good news: You can take steps to reduce the likelihood of these scenarios and simplify the process of getting paid. Keep in mind, every freelancer has their preferred methods. We’re creative types, right? So, the odds that everyone will conform to the same pattern are roughly the same as the odds that my book sales will beat Stephen King’s. Still, I think a few guidelines are helpful. It’s good to at least know what you’re getting into and have some basic ideas to follow. Here’s a few tips, based on my experiences with getting P.A.I.D. Freelancing isn’t your typical 9-5 job, and it doesn’t pay the way an office job does, either. You don’t have a neat salary that is broken into 26 paychecks a year that arrive in your bank account every two weeks. That’s way too simple. Where’s the fun in that? Getting paid for your freelancing writing requires a little more work. But, once you have a system in place, it’s not too bad. The first step is to decide what payment methods you are willing to accept. Then, set up the necessary accounts. Check (mailed to your home address) – Yes, people still write checks. Some clients or regular employers may cut you a check. If they are a larger entity, such as a marketing firm, they probably have a service that sends these out for them. It’s also possible to receive an old-fashioned, hand-written check with your name on the “Pay To” line. The pros: A paper check avoids any potential online fees. Transfers and deposits through various internet sources often stick you with flat fees or percentage fees that reduce your net pay. Those make me sad. The cons: You have to add “bank deposit” to your list of errands. Don’t worry – it doesn’t take long. More importantly, if you’re working with a brand-new client, you have to trust that their check will clear. I’ve personally never received a bad check. If it’s issued by a company (as opposed to an individual), it’s especially unlikely you’ll have an issue. The other con – you have to wait for accounting to cut you a check and send it through snail mail. PayPal – You can create a personal PayPal account, a business account, or both. This account allows you to receive payments online, which you can then transfer to your bank account or keep in your PayPayl account to use for other online transactions. The pros: This is easy to set up and simple for clients to use. Most people are familiar with PayPal, but a client does not have to have an account to pay you. They simply need the email address you use for your account, and they can send your payment quickly and efficiently. It arrives immediately, so there’s no delay in getting paid. Yes! The cons: It’s not free. It doesn’t cost anything to set up an account, but you have to give PayPal their cut of every transaction. Currently, PayPal charges 2.9% + $0.30 per payment. If you have international clients (since you can work from anywhere), that rate goes up to 4.4%. You may be able to make arrangements with each client for their account to cover the fee, or you can simply keep this reduction in mind as you set your rate. Direct Deposit – There are a host of services that perform direct deposits. You can set up your own, or an employer may ask you to enroll in the one they use. This typically involves creating a login and setting up an account with their service. The pros: Once you set up the account, it’s easy to get paid. You shouldn’t have to pay any fees, and the money will go right into your account (without a run to the bank). The cons: You have to give out personal information about your bank account. I’ve never experienced any problems with this. But, it’s good to do a little research to vet any system you are asked to use. Ensure it’s legit, then only provide info under secure settings (don’t email your bank account info to the client). Google Wallet – This app is similar to PayPal. You provide your email or phone number, and anyone can send you money (whether or not they have the app.) If you have a Google account and debit card, this is easy to set up. The pros: Similar to PayPal. You can get money quickly and simply. The big plus: it’s free. The cons: Google Wallet only works for domestic clients. Anyone outside the country has to find another way to pay you. Additionally, you can use it if you are set up as a sole proprietorship, but not if you have incorporated your business. Wire transfer – This involves transferring money to your bank account, but it is a different process than direct deposit. This is a service banks offer, and there’s almost always a fee. The pros: It’s fast and direct, like other online transactions. The cons: I don’t recommend accepting this form of payment. The bank fees are usually steep, and you will probably have to provide your bank account info directly to the client, rather than through a secure online deposit service. As you set up your payment methods and begin to collect payments, there are a few things to keep in mind. 1099s – As an independent contractor, you will receive a 1099 from employers (instead of a W2) for tax purposes. This form shows how much you earned from that client during the calendar year. Records – Keep in mind, you must track all of your income. Not every job will result in a 1099 (and the ones you receive might not be accurate). For your own budgeting, as well as tax purposes, keep detailed records of what you earn, what you receive, and what expenses you incur. Software – QuickBooks is a popular option for small businesses, but there are plenty of others. These systems typically allow you to invoice, track payments, prepare totals for tax time, etc. But, I’ll let you in on a little secret: You don’t have to use any of those. For many people, it might be worth the cost and effort. Personally, I like to keep things as low tech, simplified, and cheap as possible. I track all my income on spreadsheets in Excel. I use these to record my income goals, set my budget and prepare tax totals. What’s the best method for you? That depends on your personality and budget. You’ll have to find what works best for your needs. I simply want to give you the heads up that you’ll need an organized system to stay on top of payments. A major part of your payment system is invoicing. Again, I like to follow the trusted “keep-it-simple” mantra. 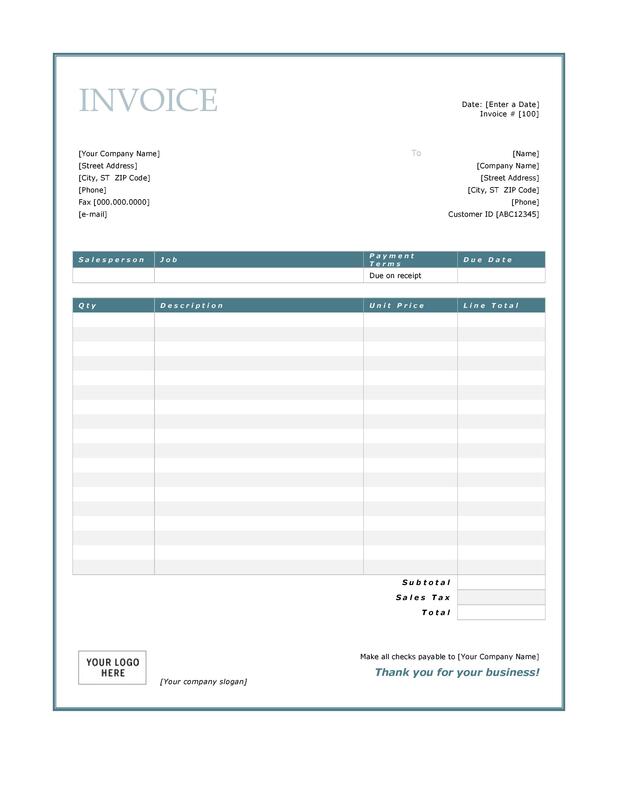 When I was first starting out, I searched for an invoice template in Microsoft Word (there’s a slew of them). I chose one I liked, personalized it with my logo and info, and have been using it ever since. I tweak it to match each job and client, but it’s basically the same Word doc you see here. As I mentioned above, you can use other bookkeeping software and online programs to create invoices for you. Choose the level of technology you prefer. No matter what system you choose, it’s essential to stay organized and consistent. When you start working with someone, establish how and when you will invoice them for the work, how they will pay you, and when they will make payments. I have some clients whom I invoice at the completion of every project. Others, I invoice twice each month. Still others receive invoices on the 30th of every month. Some pay via PayPal. Others send me a check. I have a list of whom I need to invoice and when, and I put this information on my calendar as part of my regular to-do list. Sound too complicated? 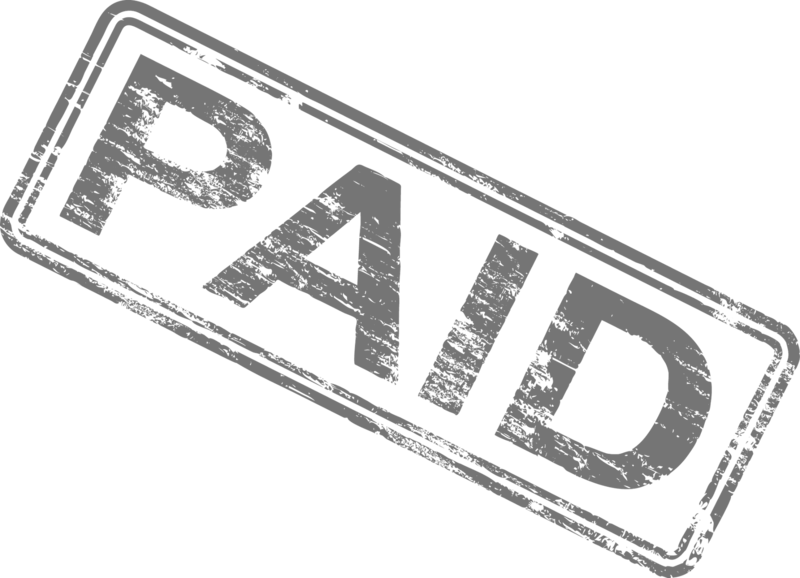 You can decide to only accept one form of payment and send out all your invoices on the same day every month. It’s your company. Just keep in mind that working with a variety of clients will probably require some flexibility. Also, if you’re concerned about delayed payments, include a stipulation for this. Make it clear when payments are due, and add a fee for late payments. Even if it’s just $5, it can motivate people to expedite payment. My last bit of advice on getting paid is simply to persevere. You’re running your own business, so you have to have some grit. It takes effort and determination. Establish organized systems and stick to them. Adjust them as necessary as your business grows. Follow up (politely) if payments are not received by the due date. Have patience but be assertive. Push through frustrating situations. Keep writing and invoicing. Accept now that you will occasionally encounter payment problems in the future. It goes with the territory. If (when) you hit snags, don’t get defeated. I once had to wait three months to get paid for an article. I’ve dealt with disorganized accounting departments who are consistently slow and have sent the wrong payment amount. I’ve been hit with unexpected fees for online transactions. Ultimately, it’s all God’s anyway. The money. The time. The talent. I’ll do my part in stewarding it responsibly. If things don’t go according to plan (my plan), I can trust He’s in control and is working it all together for my good. Once you’ve determined to press on in faith, you’ll be ready to face the next challenge. As the payments start rolling in, you’ll quickly realize that the grand total is not the same every month. With delayed payments and the ebb and flow of work availability, you must be prepared to live on a fluctuating budget. This is the next step.